We should have gotten to this sooner, but we wanted to wait for two things to happen. First the Super Bowl was soaking up all the attention on MoreThanTheCurve.com. Whether it was Tina Fey giving a shout out to Conshohocken on Saturday Night Live or the Super Bowl celebration and then the parade, if an article wasn’t about the Eagles, no one was reading it. Secondly and more importantly, we wanted to review the final campaign finance reports from the 2017 campaign. These were due at the end of January, so we gave Voter Services a few days to get everything filed. But now we are back! On January 29th, School Board Director Adam Schupack (D) took to the Whitemarsh, Plymouth and Conshohocken Democrats’ Facebook pages and attacked us. Schupack than got walloped in the comments, not by us, by parents who have been displeased with the School Board (see the comments on the Whitemarsh Democrats page). 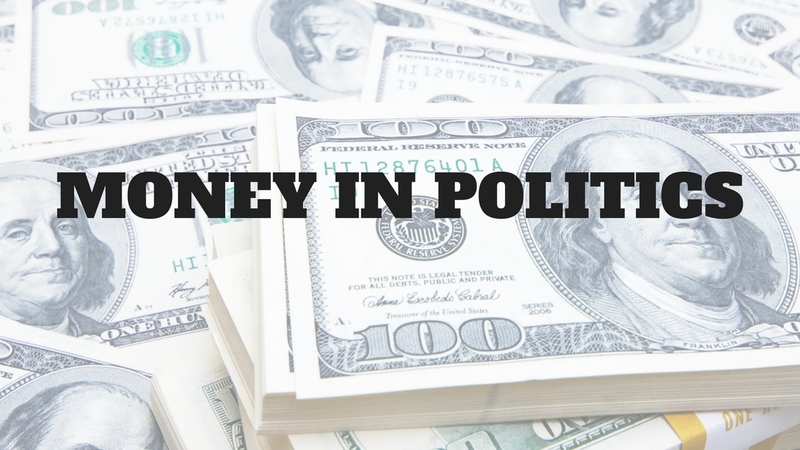 I personally would LOVE to see public financing of campaigns, but sadly we live in a Citizens United world, and I won’t fight with both hands tied behind my back. Citizens United? The only opposition to four Democrats joining the already Democratic Party dominated Colonial School Board was Republican Bernie Brady. So while four seats were up for election, really only one seat was in play. Brady’s campaign war chest was exactly zero dollars. He didn’t raise any money. The only campaign taking money from PAC’s, unions and corporations was that of Schupack and the other three Democrats (Building Colonial’s Future). 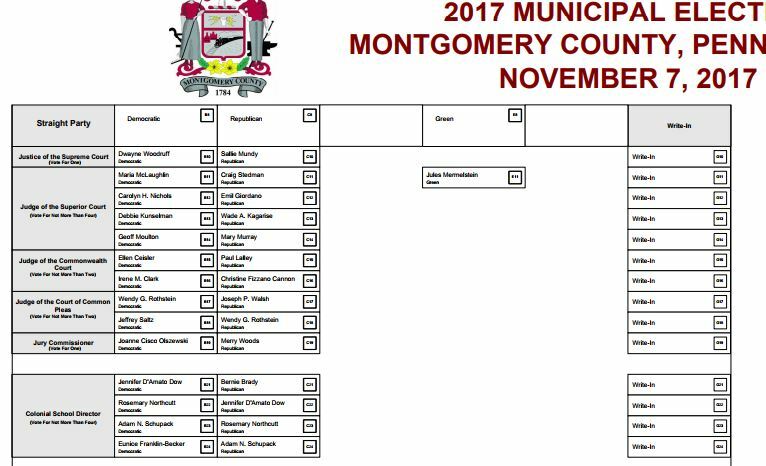 All four Democrats running for Colonial School Board cross-filed as Republicans and appeared on the Democrat and Republican primary ballots. The only person running outside of the Democrat controlled Building Colonial’s Future umbrella was Brady. He ran solely as a Republican. All four Democrats obviously won the Democratic primary in May and appeared together on the ballot for the general election in November. On the Republican side, only Eunice Franklin-Becker received less votes than Brady in the primary. So Brady was joined by three crossfiled Democrats on the Republican side of the ballot for the general election. 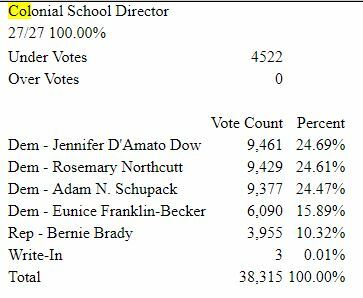 There were four seats to be won on the Colonial School Board, and Schupack and other Democrats were seven of the eight options when voting in the general election. Democrats already controlled the Colonial School Board and no matter how this election went, they were still going to control it. As we have shown, in the primary and general elections, three of the four Democrats were guaranteed to win. Schupack and the other three candidates in the Building Colonial’s Future block spent just under $16,000 to beat Brady for one seat. So who exactly was Schupack fighting? The guy who did no fundraising? The guy who didn’t receive thousands of dollars from outside the district? The guy who didn’t take money from PAC’s, unions and corporations? Lets us know what you think in the comments.